The fortnightly music and politics magazine Hot Press was launched in Dublin in 1977, just in time to cover early Irish gigs by The Clash, The Stranglers, The Ramones and The Jam. And just in time – as it happens – to keep a keen eye on U2 from their very first live chords, as members of Feedback. Niall Stokes has been editor from day one – and so was perfectly placed to raid the back issues to compile an unmissable collection of the earliest Hot Press reviews, articles and interviews with Dublin’s most famous local band. To run alongside those articles, he also commissioned retrospective pieces from some of the people who were there when it all started to happen for U2, many of whom have never spoken publicly about the band before. 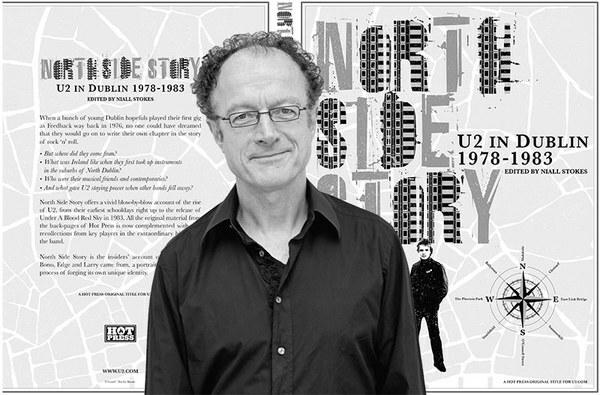 The book is called North Side Story: U2 in Dublin, 1978-1983 and published in a limited edition for subscribers to U2.com. Brian Draper spoke to Niall Stokes. What prompted you to compile this book now? We knew we had some great material in the Hot Press vaults, and personally I always love seeing that sort of eye-witness view from the time. So we thought that if we could combine that with contemporary recollections from some of the main participants during that crucial first phase, it would provide a unique insight into the way the band emerged from the murky backdrop of north Dublin. How did that come about? What were the circumstances at the time in Ireland and in Dublin? What distinguished U2 from the other bands at the time? Those are all fascinating questions. What surprised you, looking back through the old articles and reviews? So when I read Eilish Ward’s article again, I laughed out loud, because there’s something quite extraordinarily innocent about the way the story is told, and the way Bono is described, and his response to the fight... It couldn’t have been easy, violence erupting at your gig and being attacked by some of the guys you thought had come to support you. We tracked Eilish down – she’s a lecturer in sociology at the University College Galway, now – and she remembers the circumstances of the night, only this time with the benefit of hindsight. How much do the misty-eyed nostalgics - and people who claim to have ‘been there’ when they weren’t - re-write the history of those early days? It is fascinating to see how people remember things the way they want to remember them, until such time as they really have to think about them – when the truth starts to emerge! Speaking to John Fisher, who promoted the Dandelion Market gigs – those gigs were great, but they weren’t always great. The reason John kept getting U2 back was because it was working: they were drawing the crowds and he was making money. It was a very important stage for U2 – they were sharpening their act, and building a younger audience who couldn’t attend the night-time gigs. But John recalls that one of the conditions – for anyone playing the Dandelion Market gigs – was that they had to help to build the stage. Now there’s a vision: Bono, Adam and Paul McGuinness doing that. It’s satisfying to look back and see that, right from the start, there was an awareness among our writers at Hot Press, that this was potentially something really special. But the thing is, you don’t know what’s going to happen. People were responding honestly and naturally to what they saw. But even when they were skeptical or critical, they could see there was something a bit different about these guys. But what emerges really strongly from the guys who were very close to them on their home turf on the Northside – people who went to loads of the early gigs – was that from the start, Bono was talking about U2 being one of the greatest bands in the world. And that’s a hugely important factor in what helped to distinguish them at the time, in terms of their ambition. Music magazines like yours were very influential, weren’t they, back in the days before the Internet and all that ...? It’s true: when we launched in 1977, we galvanised people and Hot Press was hugely important to musicians at the time. It created a sense of community. When you look back to the letters pages – we’ve published a collection in the book where there are references to U2 – there was a real sense of engagement. All the bands wanted coverage, including U2 – but the difference was that U2 also wanted advice. Not that they wanted people to tell them what to do, but they were always open to listening to those who had more experience. They wanted to learn. Another very significant thing, looking back – especially through the extra articles we've published in the book from publications in Sweden, Belgium, Holland, and so on – is that, when they were on the road, they were much more open than most bands, talking to people after gigs, having people drop round to their hotel... I wouldn’t say it’s necessarily unique, but it’s close to it; they didn’t go out there with the attitude that they were better than everybody else, which a lot of rock and roll bands do. This isn’t just a story about U2, is it? It’s also, as you say in your introduction, a story about Dublin and Ireland. How important was it that U2 stayed in Dublin after they found success? It’s hugely important to Dublin and to Ireland that U2 based themselves here, rather than decamping to London which was the norm up until then. It benefited U2 – you could do your thinking and your developing without the record company coming down to rehearsals or trying to get too involved in the creative process. But from an Irish point of view, the working assumption was always, “You gotta get out of here if you want to be successful.” And for a band to have turned that on its head, to become the most successful rock and roll band in the world, based out of Dublin, was transformative in terms of people’s perceptions. Dublin became a hub for rock and roll music. It was recognised as a place where creativity was honoured, and – in the wider business context – one where you could find an educated workforce that could come up with great ideas and do things in a different way. A lot of that is down to U2. So the decision to stay gave Irish people for the first time the sense that, “We don’t have to go away; we don’t have to emigrate.” And that’s huge, in terms of our collective self-confidence and belief. If you could revisit any of those early iconic moments in Dublin, which would it be? Definitely the Dandelion Market gigs. To count how many people were really there. But also the night U2 played the National Stadium in January 1980 – they made a very brave decision to ‘move up’ to play that venue, and that was an extraordinary night. In fact, it was the night Nick Stewart from Island Records came to see them and decided: 'This is a band I really want'. He tells the story of that night in the book, which is amazing. It’s funny that even in your 1982 readers-poll edition, some U2 fans were worried that the band was getting a bit too big. Hot Press was quite an iconoclastic publication – wasn’t it? – launched within the punk scene of 1977. What would you have made, back then, of U2 becoming as ‘big’ as they now are? Here’s the thing: any magazine is a collection of people with different points of view and different sets of beliefs. But the spirit of Hot Press was that we put a value on the ability – no matter what the genre – to write great songs. So even when the punk thing was happening, we were writing about Jackson Browne and saying: he is a great songwriter. And we were saying of Bruce Springsteen: he’s a great songwriter. And Tom Waits. We’ve always been minded to value the ability of people to produce great songs; and also to generate the sort of electricity that only a great live performer can generate. U2 still have it on both counts. How much of the local band remains within the global brand? From the band’s point of view, that’s a very important question. The thing is, to what extent can you – through all the changes that success brings – retain in your heart the essence of what made it something you really wanted to do in the first place? And this is something you will never fully be able to explain – it’s a bit like trying to explain love, isn’t it? Why is it, how is it, what is it? If you try to break it down to explain it, it might fall apart. The truth is that there is a chemistry, something magic about it, and for a band to be able to sustain that from then until now is quite an extraordinary achievement. When the audience does become huge, the band has to respond by being available to as many people as possible. And in the way they’ve managed that, I think U2 have set the standard for others to follow. But there’s no doubt: to be able to step into the Baggot Inn again, or McGonagle’s, and to see the current U2 doing what they can do in that setting – that would be an absolutely extraordinary thing to experience. Bono seemed able to ‘give good interview’ (as you say) from the start, even as a teenager. Did that stand out for you at the time? I think it did. One of the things that some of the other bands didn’t like about U2 was that they had a seriousness of purpose which was different; it marked them out. There is within the group an intelligence, a thoughtfulness and a desire to understand things – and from early on, they didn’t want to go down the road of copying what other bands were saying or the language they were using. Bono was always striving to find a language that would express his own experiences, and those of people like him in Dublin at that time. And that extended into his approach to interviews. He always had it in him to be a phrase maker. He’d find a way of saying something that was different, which gave a sense that this was bigger or more important, that this was going somewhere. And that was the feeling that you always had with U2: that they were, indeed, going somewhere. The beauty of it is that you still do.